THE grief, shock and anger in the pubs of Balmain last night told the story of a community devastated by loss. An impromptu gathering outside the Unity Hall Hotel from 6pm was made up of friends of the six young people who lost their lives in the waters off Bradleys Head. The Commercial Hotel on Darling Street had changed hands on Wednesday and it is understood that staff from hotels in the area had gathered to mark the occasion with a night of drinking and celebration. News travels fast in the Balmain village, particularly among young people, and yesterday groups of teens and 20-somethings gathered in the many hotels dotted along Darling Street for an impromptu wake. "I lost three of my mates; that's how I feel," said a friend of the victims, who did not wish to be named. "Another is in hospital with a broken neck and I don't know where one of them is at all." Accompanying the grief last night was the stress and the confusion about what had happened. "Everything has been word of mouth," one 21-year-old said. "That's the worst bit. "We still don't know exactly who was involved and what happened. We are still waiting for confirmation." One of the victims, Stacey Wright, 21, worked at the Unity Hall Hotel. She was a popular figure with patrons and staff. "Everyone here loved her," said Ms Wright's friend and colleague Alicia. 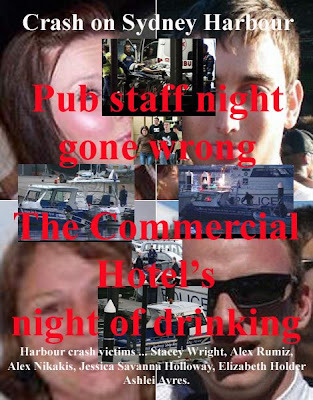 Ms Wright's shift had finished less than three hours before the accident. "She was so bright and bubbly - she was a lovely person and a great friend. This is a huge loss for all of these people. All of them are here in Balmain." Another resident, Darcy Burne, said the accident was a tragedy for the young people and their colleagues and friends. "This is a very tight-knit community," Mr Burne said. "Almost all of the young people here know someone who is involved in the accident. "They were very valuable members of the community. It is going to devastate people in Balmain." Mixed with the grief was disbelief at the circumstances of the disaster. Some said they could not understand the decision to pile into a small boat built for eight people. "I don't know why they did it; I just wish they hadn't done it," said another friend of the victims. Balmain residents were woken in the middle of the night by the sound of police helicopters overhead. Others learned of the news as it broke on websites and radio across the city. There was confusion and high emotion throughout the day as, bit by bit, news of the tragedy unfolded.